an instrument designed to measure distances by means of the time required for electromagnetic waves in the optical or infrared regions of the spectrum to cover the distance. There are both pulse and phase-comparison Geodimeters, classified according to the method used to determine the passage time over the distance to an object and back again. The pulse type measures distance according to the time between the moment a pulse is emitted by the transmitter and the moment when the pulse returns from a reflector erected at the end of the distance being measured. The phase-comparison type makes measurements according to the phase difference between the sinusoidally modulated radiation that is transmitted and the reflected radiation that is received. Phase-comparison Geodimeters are the most common (see Figure 1 for a simplified block diagram). Incandescent lamps (3–30 watts) and gas-discharge lamps (50–100 watts) were formerly used as light sources; they have been superseded by gas and semiconductor lasers. Usually amplitude modulation at frequencies between 10 and 80 megahertz is used so that a phase difference of 1° corresponds to a change in distance of less than 1 cm. The modulator and demodulator are identical in design; their operation may be based on the Kerr effect or the Pockels effect. The alternating voltage that modulates the luminous flux is produced by a scale-frequency generator, so-called because the wavelength corresponding to the scale frequency determines the scale for converting the phase difference to a distance. The modulated light is focused by a lens or mirror-lens optical system into a narrowly directed beam, which is transmitted to the reflector. 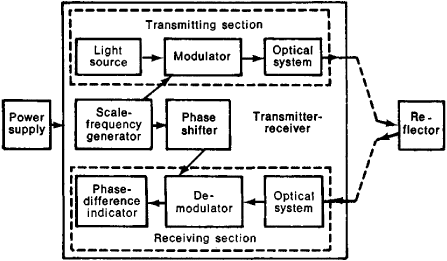 The reflected light is focused on the demodulator by an optical system similar to that of the transmitting system. The magnitude of the phase difference registered by an indicator at the output of the demodulator depends on the relation between the phases of the received optical signal and the voltage that controls the demodulator; a phase shifter makes it possible to determine the specific relationship and to compute the registered phase difference, from which the distance is calculated. The phase-difference indicator may be the eye of an observer or a photoelectric instrument with a pointer connected to the output. Geodimeters can measure distances up to 50 km with a mean square error of ±(1 + 0.2D km) cm, where D is the distance measured. The weight of the instrument ranges from 30 to 150 kg, and the power consumption is between 5 and 150 watts. GOST 19223–73: Svetodal’nomery: Tipy, Osnovnye parametry i tekhnicheskie trebovaniia. Genike, A. A., B. A. Larin, and V. M. Nazarov. Geodezicheskie fazovye dal’nomery. Moscow, 1974. Litvinov, B. A., V. M. Lobachev, and N. N. Voronkov. Geodezicheskoe instrumentovedenie, 2nd ed. Moscow, 1971. Kondrashkov, A. V. Elektroopticheskie i radiogeodezicheskie izmereniia. Moscow, 1972. That year Natmap introduced electronic distance measuring in Australia with the use of a Swedish AGA Geodimeter model NASM-1 to remeasure numerous triangulation base lines and triangle sides. Technological change in this period was immense as we went from the steel measuring band to the Geodimeter, Tellurometer, Aerodist and other electronic distance measuring systems and then to satellite-borne positioning and imagery-acquisition systems. To meet mission requirements, Detachment 8 acquired the Geodimeter 5600 Servo Direct Reflex (DR) 200+ with the Trimble[R] Automated Control Unit (ACU) Survey Controller as the gun. 2001) have performed a joint inversion of the InSAR and two color geodimeter data from Long Valley Caldera for the period between 1996 and 1998 that suggests that the deformation source has a shape of a steeply dipping prolate spheroid having a depth of 7 km and excess pressure of several MPa. Shallow and peripheral volcanic sources of inflation revealed by modeling two-color geodimeter and leveling data from Long Valley Caldera, California, 1988-1992. A 10m grid survey using a Geodimeter 610 total station confirmed that we had again easily achieved the +/-10mm accuracy target. in Louisville, KY, as a Geodimeter dealer for Spectra Precision will increase the company's distribution of surveying instruments in the Midwest. At night, Hamann controls the two-color geodimeter, an instrument that aims laser beams at reflectors across the fault to measure plate movement. Additional data were collected using a Geodimeter surveying total station from Geotronics of North America (Itasca, Illinois). Watershed topography was characterized using a Geodimeter Model 136 (1) survey instrument. We would be using the most advanced surveying methods: GPS; Vanguard 505 (Earth Vectors Company, Irvine, California), the new remote-sensing, non-contact roadway surveying system; digital levels; field-based computer systems; and Geodimeter total stations (Geotronics of North America, Inc. When deciding how to best approach the job and what equipment would enhance our operations, we discussed the traffic safety issue with Geodimeter representatives.